If you’ve ever wondered what a magician carries in his proverbial box of tricks, you won’t want to miss Le Cirque Invisible, not because the content of its box is atypical, but because it is never, what you’d expect. As happy surprises are always good for us, I’d advise you to buy tickets for a performance for whatever day you’re reading this on and be prepared to release your inhibitions, not those requiring inebriation, but those which were reigned in, in the scheme of things as you left childhood behind to allegedly, pull your own weight. Given last year’s rapturous reception and quick sell-out of this show, act fast to avoid missing out on the magic! I’m actually coming at this review backwards, as I first saw and marvelled at the show of this illustrious pair, Jean Baptiste-Thierree and Victoria Chaplin’s, daughter – Aurelia Thierree, L’Oratorio d’ Aurelia, directed and choreographed by her mother, at the Lyric Hammersmith a few years ago. It was understood then that Aurelia, gifted part contortionist, part illusionist, was one of two offspring of two great circus stars - Jean-Baptiste Thierre and Victoria Chaplin, fourth of eight children of Charles Chaplin and Oona O’Neill. A’s similarly talented sibling, James Theirree, performed in two acclaimed shows of his own in recent years. What I couldn’t have understood when enjoying Aurelia’s unusual gift for personifying curtains and other inanimate objects, gracefully navigating through a chest of drawers and other similarly logic defying feats, was just how great Aurelia’s parents, who met and married in 1969 were and are at their own uniquely imaginative blending of circus/ dance/ theatre and music hall inspired arts. Although I usually manage to catch a good cross section of each year’s contemporary circuses passing through London, I can’t remember ever seeing a more diverse pair of performers then Ms. Chaplin and Mr. Thierree and a big part of the fun of this show is noting the contrast between their performing styles. Not only is Ms. Chaplin, who began her creative life dancing, a contortionist like her daughter Aurelia, but she is also a dancer, musician, tightrope walker, unicyclist and perfect straight-woman, albeit a surrealist one, to Thireee’s inspired lunacy, which encompasses not only hilariously endearing sight gags, but some pretty awe inspiring magic tricks. Thierree assumes an angelic countenance akin to that of Harpo Marx and has a similarly bushy head of hair, which in themselves might inspire laughter. This is fitting, as laughable irony abounds in this show, most of it injected by magician/illusionist Thierree, which is in itself somewhat ironic, as Ms. Chaplin excels in creating illusionary landscapes, always in conjunction with motion, and the sets and self-designed costumes she employs in the creation of her intriguing scenarios, are often transformed into mythic creatures such as a trotting white horse, or a hungry monster from the deep who seemingly, gobbles her up until she vanishes. Conversely, Thierree’s input, which is sometimes reminiscent of Music Hall comedians and his own, often broad ideas of humour, plays directly to the audience and we are drawn into responding to his whimsical give and take before we realise what is happening. However, as our surrender is so enjoyably cathartic, we merely shrug and smile at the thought. This show is magical from start to finish and part of its’ timeless charm is the fact that there are no signs of technology here, apart from maybe, some radio controlled props. Absent are high powered projections, distracting light shows and other contemporary voodoo. As a result, we come face to face with talent, minus machinations designed to intentionally enhance the ‘wow’ factor. As Ms. Chaplin focuses on her graceful tightrope walking, we focus on her. Similarly, as Thirree beguiles us with his magic tricks, some of which unexpectedly dazzle, we are genuinely puzzled as to how he managed to turn that scarf into a dove, intermittently chuckling at his seeming, disappointment whenever a trick predictably weakens into collapse. He seems to be saying he’s just like us, after all – a comforting and generous thought in light of his talents. 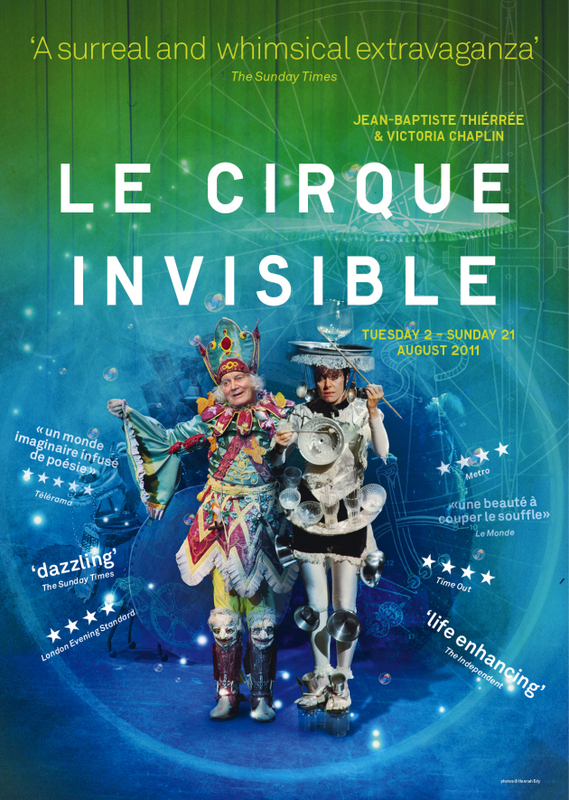 Le Cirque Invisible is chock full of stimulating moments which alternatingly make us laugh or hold our breath for fear of distracting the performers. And it’s pretty remarkable that in a hall the size of the Queen Elizabeth, these two performers, accompanied by no one else other than some doves, ducks and rabbits, can beguile us so. The world may seem particularly low on magic right now, but this especially intriguing corner of it still runs on too oft neglected imagination.